My daily watch before my Seiko. 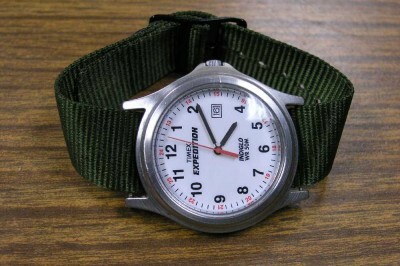 It is a Timex Expedition, Military Style. Goodness knows what the model number is. It has a quartz movement, battery powered. As such, it is on its 3rd battery after 13 years of use. Case: 38.5mm diameter, base metal, 50m water resistance. Back: Stainless Steel, snap on. Movement: Quartz, Calibre Unknown, Made in Philippines , Hacks. This is the watch I wore through college ( I graduated in 1998.) It still keeps good time. I recently bought a new leather band for it, its third and a new battery, also its third. It is a Timex, and it does take a licking and keeps on ticking. Speaking of ticking, you can hear this sucker across a quiet room. The Indiglo works really well, but it does require interaction to work. Now that I have a watch with luminous hands and markers, pressing a button can be a pain. The crystal is a let down on the watch. The acrylic scratches pretty easily, and it looks pretty beat up. Although the watch looks like it is stainless steel, it is something else, and it is starting to show though. For $30, I really can’t complain. It has served me well, and on the new band it looks pretty sharp. I wear it when I don’t want one of my better watches to risk damage or for sentimental reasons. It is a very easy watch to read and can serve as a flashlight in an emergency. As of 10/30/2008 this watch is no longer in my collection. The wear through of the plating made the watch react with my skin. Goodbye, old friend. The leather band is now on the Speedmaster. 12/19/2009 Update. I pulled this old friend out of the junk heap and decided to give it another chance. I put is on a $5.00 nylon band which does 2 things. 1) It keeps the base metal away from my skin, making it wearable again and 2) it gives it a really military look, which compliments the watch well. Another important change is that I polished most of the huge scratch out of the crystal, making it look years younger. I will keep this watch as a beater until the battery goes, then it is just not worth it. 12/31/2013 Battery went out one last time, bought some new ones, but after replacing, the movement kept getting stuck at 39 seconds after the hour and it really is not user serviceable at all. They don’t make replacement movements for $30 watches. So, off to recycling it went. Happily, I have replaced it with a new Seiko 5 field watch.